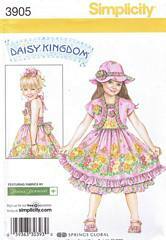 Daisy Kingdom Dress, Hat and Bolero Jacket pattern. Child's Sizes 5, 6, 7 and 8 are all included for dress and bolero; Sizes Small, Medium and Large included for hat. Dress with halter tie neckline has elasticized back bodice and back tie. Bolero jacket has short kimono sleeves. Hat has six section crown and scalloped brim. Copyright 2007. New and uncut. Now out of print.